Totally, totally, speculative, but here goes. Perhaps the reason that the House isn’t manufacturing scandals is because the changed media environment has changed the incentives. In the old days, opposite-party Congresses had to work hard to manufacture scandals good enough to get the neutral press to notice. Now, why bother? Most partisans, and especially the primary voters that Members of Congress are increasingly most worried about, get most of their news from the partisan press, and they don’t need any Congressional stamp of authority to consider something a legitimate scandal worthy of devoting hours of programming to. “As Clint Eastwood says, a man needs to know his limitations,” Issa said….While he promises an ambitious — and some say confrontational — agenda, Issa is making overtures to the Obama administration: He already has a meeting scheduled with Vice President Joe Biden to discuss stimulus oversight. 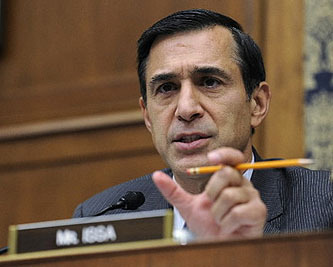 Issa also wants to avoid the sometimes petty controversies that enmeshed Rep. Dan Burton (R-Ind.) as committee chairman during the Clinton presidency and sometimes made him the issue. It pains me to say anything nice about Issa, the man who bequeathed us Arnold Schwarzenegger, but maybe he takes this stuff more seriously than his critics ever gave him credit for. Obviously he’s going to focus his attention on conservative causes and he’s going to focus his oversight on the Obama administration — both perfectly reasonable things to do — but perhaps he was sincere about avoiding petty nonsense. Stranger things have happened.